Illnesses of a chronic nature come from detrimental environmental imbalances that affect the physiology. Dr. Otto Bergsmann, a professor at the University of Vienna reported changes in serum values of calcium, zinc and serotonin in humans after short-term exposure to non-life supporting earth radiation sites. Even this limited exposure undermined the immune systems when exposed to these negative forces. Spending longer periods of time in unhealthy environments can gradually deteriorate the health. Alterations in biological functioning can lead to adverse health affects. If sleep patterns are disturbed this not only can make you feel tired and irritable, it can produce a litany of more serious illnesses over time. The body’s resistance to viruses and bacteria can become affected when the natural rhythms within the body are constantly distorted during sleep. Dr. Paul G. Seeger, Former Chief of Cancer Research at Charite Hospital, Berlin, Germany states that the billions of dollars spent on cancer research around the world has not produced convincing proof of the cause of cancer. He feels that thorough investigation of telluric (earth) radiation will provide a possible prime cause of cancer in humans. As early as the 1920’s, there have been studies done in Germany (Winzer-Melzer survey of Stuttgart) which determined that major geological faults, which emanated noxious radiation, crossed under the beds of a high percentage of cancer victims. Hundreds of studies since then (by Dr. Ernst Hartmann of Germany and others) has shown that radiation that builds up on crossing geopathic stress lines can weaken the immune system and cause many diseases. In a number of European countries having a survey for geopathic stress before buying or building a house is automatically undertaken. 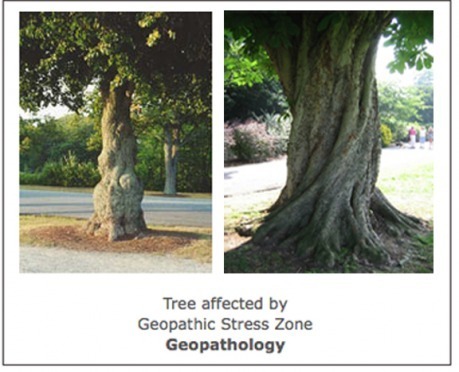 GETTING RID OF GEOPATHIC STRESS IS EASY! How do you know if you suffer from geopathic stress? The average person spends six to eight hours a day in the bedroom sleeping, making this part of the house the most likely to transmit geopathic stress into the body, if it exists underground. Cats tend to sleep in places of geopathic stress, while dogs avoid them. Pulling your beds and desks away from the wall at least 4" will reduce the impact of geopathic and electromagnetic stress coming from wires and pipes in the walls. Several copper rods attainable from your local hardware store - #4 copper wire. You will need to either have them cut or cut them yourself 18" long. You should have at least 10. Hold the short side of each L in each hand. Do not squeeze the rods too tightly as they need to move. You want to walk around the perimeter of your home or office clockwise. You can do this outside or inside, room by room. Begin by taking a deep breath in and out. After you do this, ask to be shown the geopathic stress lines coming from your left that are harmful to your health. Holding the rods parallel to the ground and parallel to each other, walk in a straight line slowly around the perimeter of your property or room. Where the rods cross, you have found a geopathic stress line. For outside: Every time the L rods cross, copper staples must be placed at each spot where they cross. Take one copper rod and bend each end 2", forming a giant staple and push the bent ends into the ground. For inside: Lay a straight copper rod parallel with the wall at the each spot where the L rods cross. Doing this will divert harmful radiation supporting healthy people and a stress-free environment.